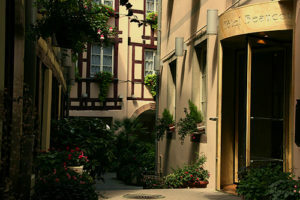 The Hotel Beaucour is a delightful boutique hotel, nestled in the heart of old Strasbourg. 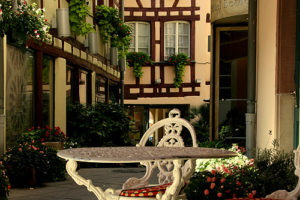 It boasts 49 fully-equipped rooms with charming Alsatian décor, most with views overlooking the hotel’s peaceful courtyard. Only a few minutes’ walk from the Cathedral and within easy walking distance of many shops, bars, cafés and restaurants, the Hotel Beaucour is a perfect base for you to explore this delightful city. Parking is available at the hotel at a charge of 13€ per day. 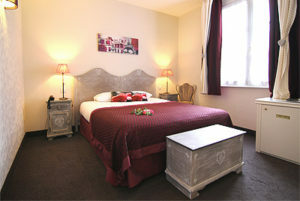 Breakfast is served as a buffet in the Alsatian dining room and you will find complimentary WIFI throughout the hotel. There is a beautiful, tranquil courtyard area perfect for relaxing away from the bustling city. The 24 hour reception team are happy to help and provide currency exchange, a concierge service as well as newspapers and dry cleaning. All rooms in the hotel benefit from air-conditioning, satellite televisions, direct-line telephones, mini- bars and en-suite facilities. Charme rooms have double or twin beds and a bathroom with a spa-bathtub or guests can choose to upgrade to a Junior Suite or Duplex, where they benefit from additional space, a welcome tray with tea and coffee, bathrobes and slippers as well as a second television.